During their trip to Westmont the week of July 9, the Hsinchu County Sister City delegation visited numerous businesses in the area to learn about and investigate various business opportunities in Westmont. The group, led by Hsinchu County Magistrate Ching Chun Chiu, included members of the Hsinchu County Economic Development Committee. While in Westmont, the group visited Chicago Prostate Cancer Center, The McCrone Group, China Furniture, and more. “We were honored to have the Hsinchu County Sister City delegation visit us and learn more about the medical advancements at Chicago Prostate Cancer Center,” said Brian J. Moran, MD, Medical Director of Chicago Prostate Cancer Center. Magistrate Ching Chun Chiu recognized the benefits of seed implants as a treatment for prostate cancer with the high cure rates, ability to maintain quality of life, and low cost provided with this treatment. 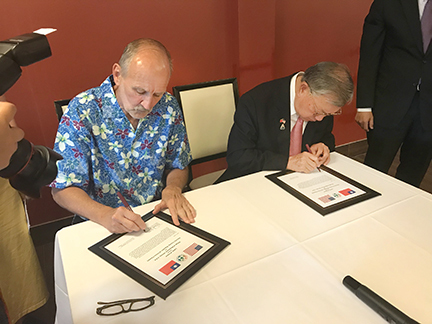 Working with the Taipei Economic and Culture Office (TECO) in Chicago, the Village of Westmont and Hsinchu County signed a letter of intent, which specifically addressed the interest in pursuing the possibility of opening a satellite Chicago Prostate Cancer Center in Hsinchu County of Taiwan. For information regarding the Sister City Program, contact Committee Chair Larry McIntyre at lmcintyre@westmont.il.gov or 630-417-0280. For more information regarding the Chicago Prostate Cancer Center, visit prostateimplant.com or call 630-654-2515.